Aquabatix has had a busy and varied year in 2018. From performing in LA, London and Paris, to featuring on the big screen with middle aged men showing off their synchro skills and performing a contemporary art piece which appeared in Frieze magazine. Aquabatix certainly excels in the mixed variety of aquatic work that we dive into. Here is a pick of our most memorable moments from 2018. 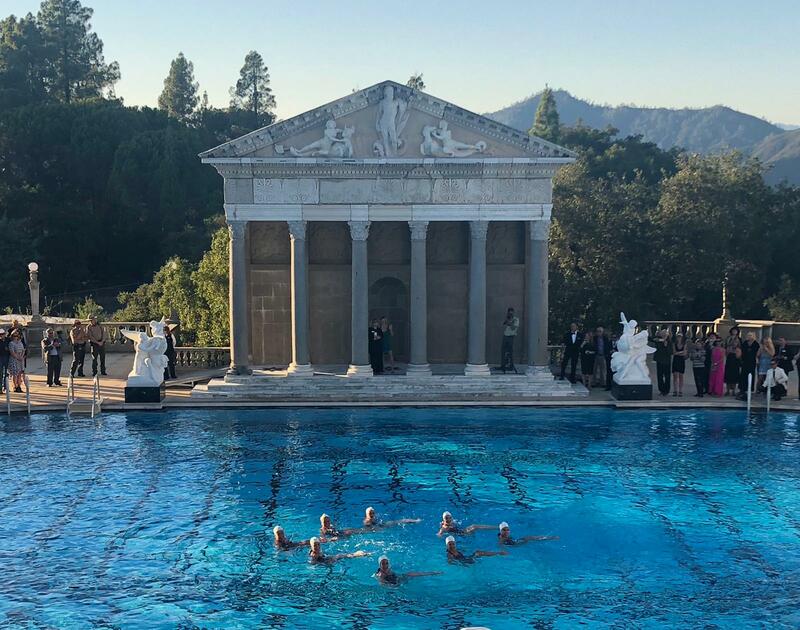 When Aquabatix USA was invited to perform at the newly refurbished pool at the famous Hearst Castle, we jumped at the chance. 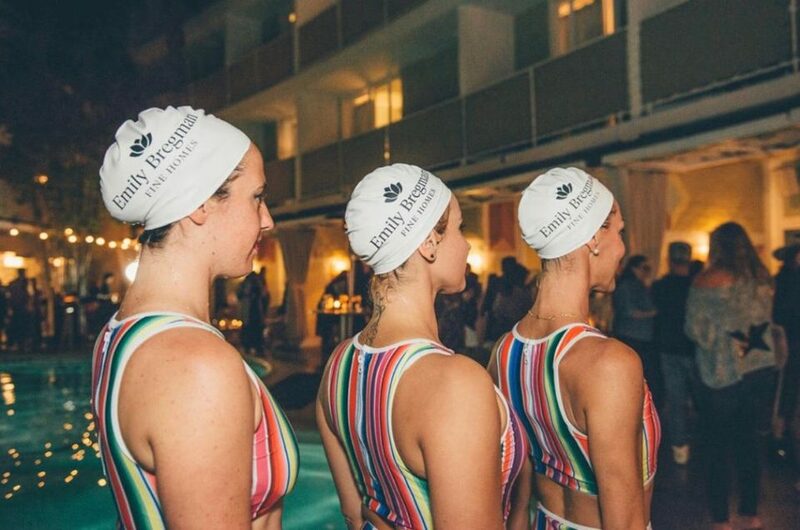 The beautiful pool, surrounded by Roman pillars and views overlooking the Pacific ocean, has taken four years to renovate and Aquabatix were the first to dive in to perform at the opening pool party whilst the sun set over the sea. It was a magical moment and one Aquabatix USA will never forget and was covered by the New York Times. Turner Prize nominee Janice Kerbel had a vision of numerous synchronised swimmers performing a library of moves to the beat of a metronome, whilst gradually playing with the concept of what the general perception of synchronised swimming involved and throwing that to the wind! There was no glitz or music for this contemporary art piece. Just 24 synchronised swimmers, performing similar movements and gradually ‘un-synching’ as they proceeded through the sequences for eight minutes. A challenging project for anyone used to synchronising and symmetrical formations, but one Aquabatix rose to it and along with Janice and the Common Guild, achieved the vision of performing the piece in front of several audiences in Glasgow at the European Championships culture festival and featuring in the highly regarded Frieze magazine. You can watch how we created the piece here. A British movie that was filmed in 2017 and released in the long hot summer of 2018, which saw several middle aged actors perform some reasonably difficult synchro moves on the big screen. 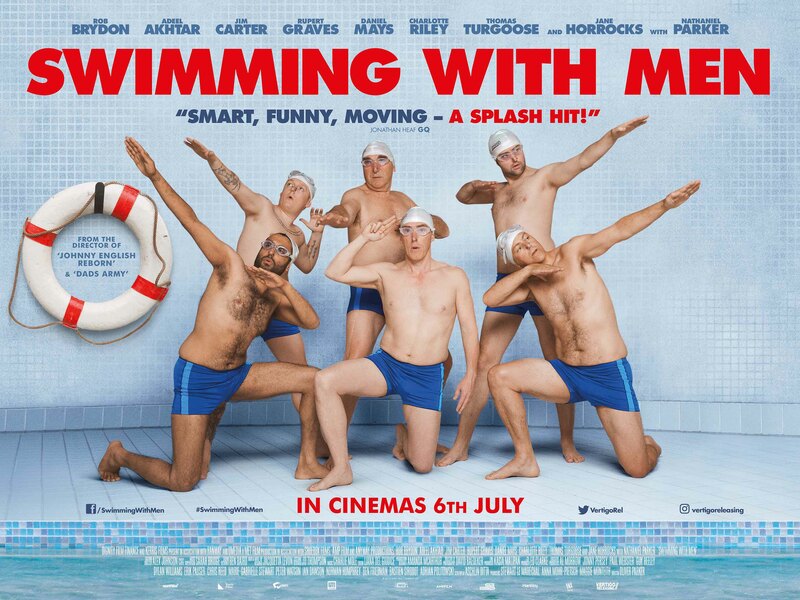 Rob Brydon joined Rupert Graves, Jim Carter, Adeel Akhtar, Daniel Mays and Thomas Turgoose in the team of mishaps, coached by Charlotte Riley who also mastered more technically difficult moves to perform with some of the Aquabatix team in the film. Synchronised swimmers Chris Jepson and Ronan Daly made a splash making up the team of eight. The team also appeared on BBC One performing a specially created routine just for Sport Relief. The film is out now on DVD and digital download available here. Aquabatix loves to be involved in innovative and creative concepts and two new high end magazines were launched in 2018 with Aquabatix featuring heavily alongside top models. In London, Girls Girls Girls magazine was launched early 2018. Created by fashion photographer Claire Rothstein, Aquabatix posed with the incredible Nimue for the shots at the London aquatic centre where the 2012 Olympic pool events were held. Later in the year, Venomous magazine launched in LA. Photographer Blaise Cepis this time taking photos of the Aquabatix USA girls in the pool with models, in a Helmut Newton inspired shoot. Creating a twenty minute show with eight swimmers is where we found ourselves in June, performing in one of Paris’s most charming pools, Piscine Molitor. 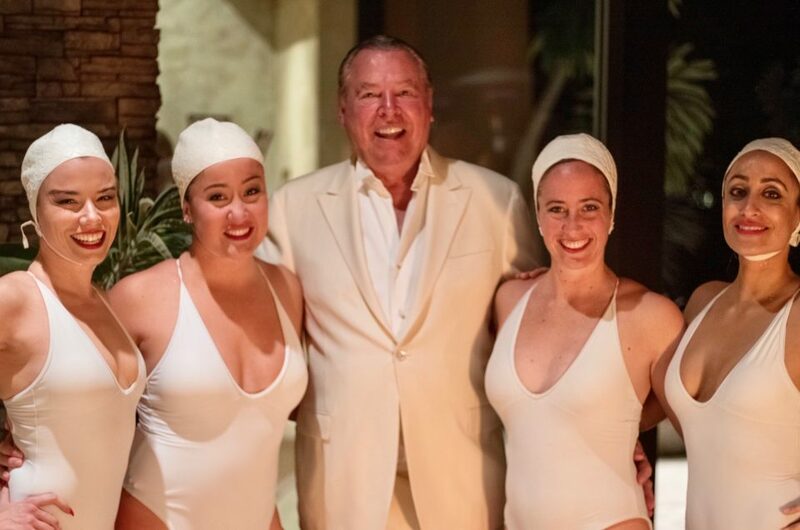 Performing for an anniversary, guests surrounded the poolside and balcony, to watch a catwalk show on clear Perspex runways over the pool, followed by our show. Other memorable highlights from the year include dressing up in furry sloth outfits for a music video, performing for corporate events including Tangleteezer, St Tropez and Local Mercato as well as a big Indian wedding, Help For Heroes charity event and numerous shoots such as Arena Homme Plus, Be At One, Dollar Shave Club and a luxury carpet brand. We have also filmed and shot some exciting projects being released in 2019, and with many more exciting events in the pipeline, keep watching this space! Thank you for all your support in 2018. Follow all our updates on instagram @Aquabatix1 and @AquabatixUSA , Twitter as @Aquabatix1 and Facebook Aquabatix and Aquabatix USA. You can also find us on youtube .